Get a free and unlimited version of IBM ILOG CPLEX Optimization Studio through Academic Initiative if you are in academia. Take advantage of IBM tools and resources to help you become skilled in mathematical modeling. 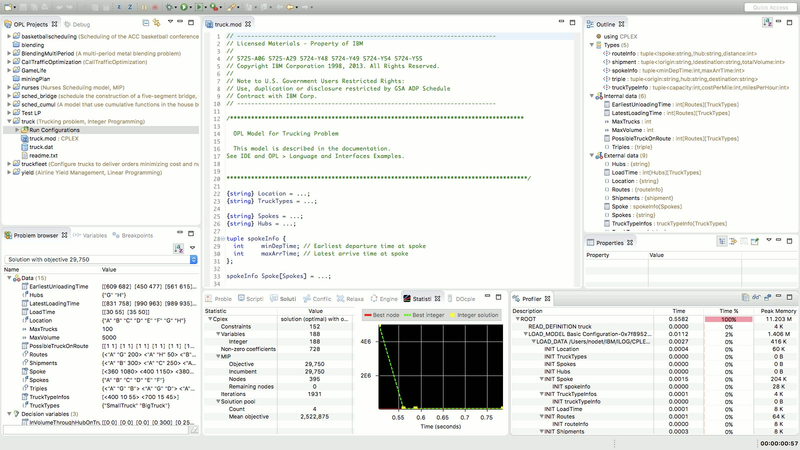 Introduce IBM ILOG CPLEX Optimization Studio to students with this complimentary workshop. IBM® ILOG® CPLEX® Optimization Studio uses decision optimization technology to optimize help you improve your business decisions, develop and deploy optimization models quickly, and create real-world applications that can significantly improve business outcomes. How? 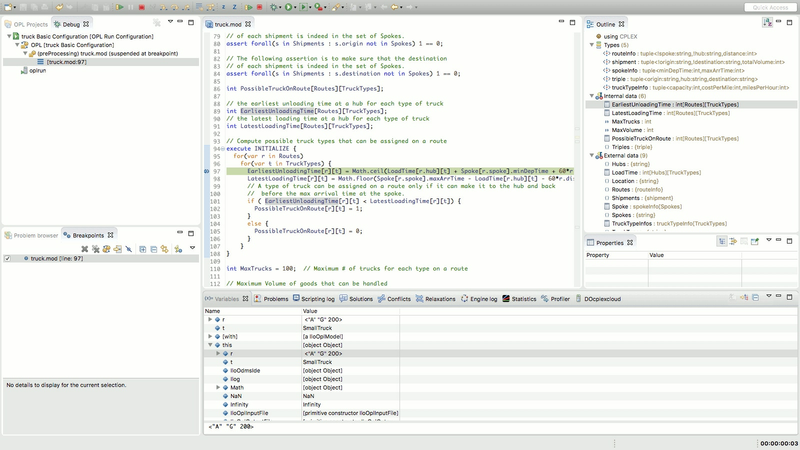 IBM ILOG CPLEX Optimization Studio is a prescriptive analytics solution that enables rapid development and deployment of decision optimization models using mathematical and constraint programming. 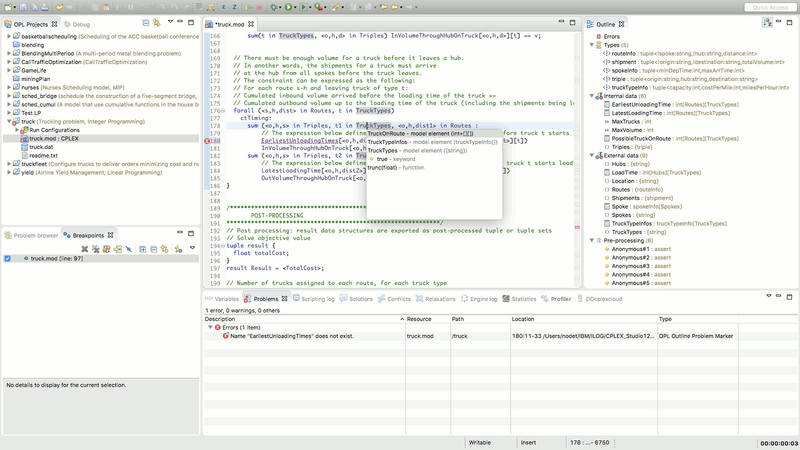 It combines a fully featured integrated development environment that supports Optimization Programming Language (OPL) and the high-performance CPLEX and CP Optimizer solvers. It’s data science for your decisions. Get up and running in less than 15 minutes with the Developer and Deployment options, now available in a monthly and annual subscription. Solve multiobjective problems with CPLEX including hierarchical, blended, or combinations of both. Get significant performance improvements for MIP and MIQP problems as well as constraint programming and constraint-based scheduling. Embed OPL models into Python and easily use pythonic data structures to read and write tabular data. 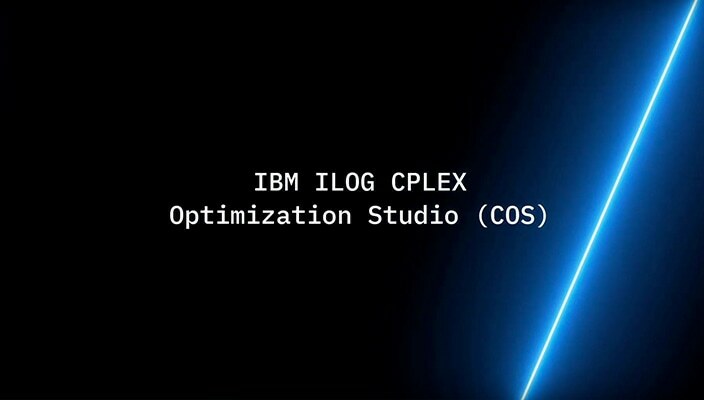 Explore and learn optimization and constraint programming modeling with the free edition of IBM ILOG CPLEX Optimization Studio. This fully-featured development environment for mathematical and constraint programming models has no limitation on model size. Leverage optimization engines hosted on the IBM Cloud to solve your complex decision-making problems. Deploy applications for internal business purposes or for third parties.